NBA • Now 35, Truman has some amazing stories to share. Courtesy of Preson Truman Former Utah Jazz ballboy Preston Truman hands Michael Jordan a towel for a regular-season game Feb. 4, 1998. It was Jordan's last regular-season visit to the Delta Center with the Bulls. 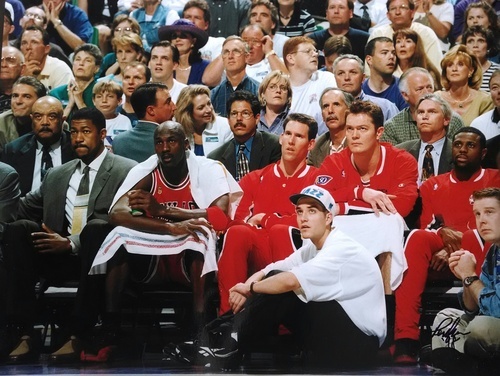 Courtesy photo | Preston Truman Michael Jordan sits on the Chicago Bulls bench at the Delta Center during the "Flu Game," in which he led the bulls to a 3-2 NBA Finals lead on June 11, 1997. Seated on the floor at right is former Utah Jazz ballboy Preston Truman. 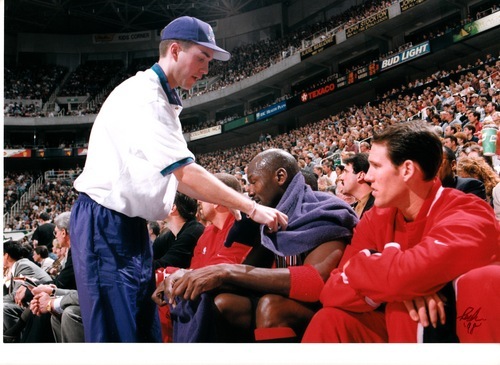 Courtesy of Preson Truman Former Utah Jazz ballboy Preston Truman hands Michael Jordan a towel for a regular-season game Feb. 4, 1998. It was Jordan's last regular-season visit to the Delta Center with the Bulls. 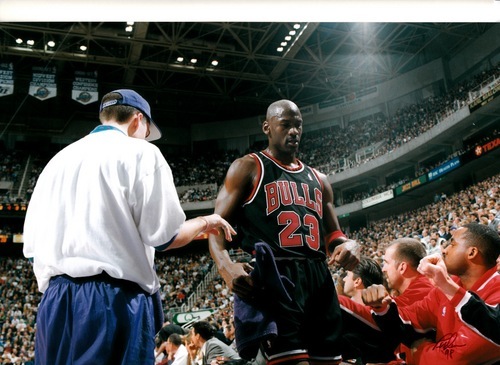 Courtesy of Preston Truman Former Utah Jazz ballboy Preston Truman stands with Michael Jordan after the "Flu Game," in which Jordan led the bulls to a 3-2 NBA Finals lead on June 11, 1997. 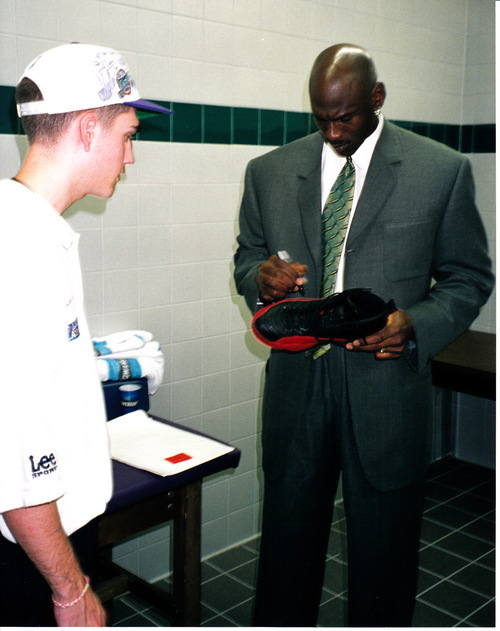 Courtesy of Preston Truman Michael Jordan signs his "Flu Game" shoes for former Utah Jazz ballboy Preston Truman before leaving the arena on June 11, 1997. 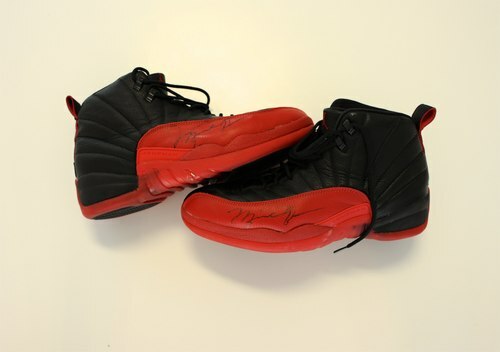 Courtesy of Preston Truman Michael Jordan's shoes from the "Flu Game," in which he led the bulls to a 3-2 NBA Finals lead on June 11, 1997. 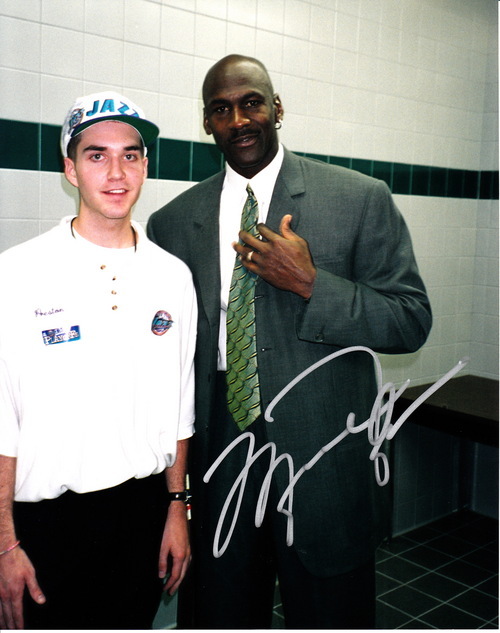 Former Utah Jazz ballboy Preston Truman is putting them up for auction, 16 years after they were given to him by MJ. If it wasn&apos;t the shoes, it might have been the applesauce. For 15 years, a safe-deposit box in a Davis County bank has housed a pair of size 13&apos;s that could put a dent in the national debt. Yet all it took for Preston Truman to earn the sneakers Michael Jordan wore during his legendary "flu game" was a little courage and some applesauce cups. 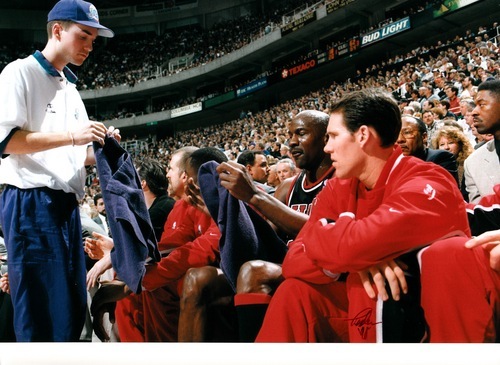 The former Jazz ball boy&apos;s tale began in November 1996, with Truman standing slack-jawed while Jordan tied his shoes before a regular-season game. "Hey," Jordan called to Chicago Bulls trainer Chip Schaefer. "Where are my graham crackers and applesauce?" This was, it seems, important. Schaefer stopped taping another player&apos;s ankle and searched his bag: Graham crackers, but no sauce. So Jordan turned to Truman. "There will be no autographs for ball boys after the game if I don&apos;t get my applesauce." Thus, with 45 minutes until the tip, Truman set off on a reckless dash through the Delta Center. Shouting "I&apos;m looking for applesauce for Michael Jordan," he came up empty on floors one and two, but on the third floor a woman in a food-storage room gave him an industrial-size can. He procured a spoon and a can opener and sprinted back to present it all to a grinning Jordan. "You came through," he said, and asked the ball boy&apos;s name. The Bulls lost that night, and MJ was slightly sour when, on the way out, he passed a table of items that people were hoping he&apos;d sign. But he saw Truman and stopped to autograph a trading card the 18-year-old had in his pocket. "Maybe I&apos;ll see you in June," he told him. Truman was assigned to the visitor&apos;s locker room for Games 3, 4 and 5, and he hatched a plan. He wanted shoes  not just Jordans, for which people in the &apos;90s would camp outside Foot Locker, but Jordan&apos;s. He asked his mom to buy some graham crackers and Seneca Apple Sauce cups, and he had them waiting in MJ&apos;s locker when he walked in. "You remembered?" Jordan asked. "That&apos;s my guy right there. It&apos;s Preston, right?" He managed not to squeal. "Yes, sir, I&apos;m here to take care of you." Jordan said he appreciated that. Before one game, when Jordan was sitting on the trainer&apos;s table, a KSL ad came on the TV. Jazz forward Antoine Carr channeled Rod Tidwell from "Jerry Maguire," imploring Utah celebrities to ask him to "Show me the title!" "He said, &apos;I&apos;ll show you the f-ing title,&apos;" Truman says. "It&apos;s moments like that where you sort of pinch yourself." The Jazz won twice to even the series 2-2, and Jordan&apos;s food poisoning was evident as doctors and trainers checked his vitals before Game 5. He lay down in a back room with an IV and asked them to turn the lights off as they left. Truman walked in. He almost turned back when he saw Jordan&apos;s eyes were closed, but His Airness had sensed him and asked that he run some tickets to will call. First, though, Truman leaned in and whispered  wondering whether this was a remotely sane thing to do  "Are you doing anything with your shoes after the game?" Jordan looked him in the eye. "Why, you want them?" "I would be honored," he said. Maybe his gall inspired MJ. Probably not. Either way, Truman had a better-than-front-row seat to Jordan&apos;s magnum opus. He was one of the first in the building to know that Jordan would play that night when, as Bulls coach Phil Jackson gathered the team to go onto the court, Jordan finally got up and put on his jersey. He watched Jordan struggle back to the bench during timeouts; he ran Jordan a spoon for three small cups of applesauce at halftime; he heard Jordan tell doctors "F- no" when they suggested he sit out for a while. Truman&apos;s parents would later tease him because the broadcast showed him  a lifelong Jazz fan  patting MJ on the shoulder after he wrapped him in a towel. When Jordan hit the clinching shot and leaned into Scottie Pippen&apos;s arms, barely able to stand, Truman estimates he was 5 feet away. "I was like, &apos;I think I&apos;m going to see this again and again.&apos; "
After the game, the shoes were underneath Jordan&apos;s dressing table while Truman went about his work. The ball boy panicked when Charles Barkley stopped by to visit  Bryon Russell had asked for MJ&apos;s shoes earlier in the season, and Gary Payton drew flak in the 1996 Finals for doing the same. But Chuck left without them. Jordan showered and dressed, and when the equipment manager reached down to pick the shoes up and pack them away, MJ told him to hold it. "Those are his," he said, pointing to Truman. He later signed both shoes while one of his bodyguards snapped photos. He then rubbed the top of Truman&apos;s head and left. The next season, Truman was working at a Fanzz store when a man came in with a fat envelope stuffed with, he told Truman, $11,000. Just hand over the shoes, he said. Truman was tempted. He didn&apos;t need money, but he was 19 years old, and it was $11,000. In the end, he decided he couldn&apos;t bear to part with them, and the shoes went to the bank instead. He&apos;s seen them just a handful of times since, and he recently came to the conclusion that they&apos;re not doing anybody a whole lot of good. "I&apos;m 35, and 40&apos;s just right around the corner, and it seems like time goes by faster the older you get," he says. "Maybe it&apos;s just time to get those things out there." He reached out to auction houses, which verified that his shoes were the real McCoy by checking that Jordan&apos;s suit in the photos matched what he was seen wearing earlier that night, and that the shoes bore identifiable scuff marks (which luckily they still did, even though Truman at one point narrowly prevented his mom from cleaning them off with a dish rag). Bidding on the most iconic memorabilia from the most iconic athlete in his most iconic game will begin at $5,000 on Nov. 18 at Grey Flannel Auctions. Similar items have gone for tens of thousands of dollars. But Truman says that to him, it&apos;s not about the money. He works in sales throughout the valley and leads a comfortable life. He&apos;s just happy to finally tell what he calls, simply, The Applesauce Story.